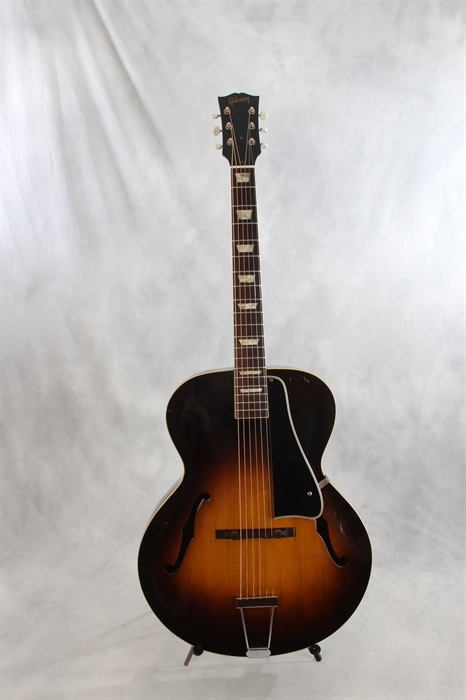 Gibson (used, 1953) L-50 Acoustic Archtop - Mandolin Brothers, Ltd.
#Z228424, in “very good plus” condition, with newer Guardian hard shell case. This is the standard description Gibson acoustic archtop guitar that debuted in 1932, became f-hole only in 1934, became 16” wide in 1935, and received an arched back as well as top the same year. In 1936 it received the simple trapeze tailpiece with the raised diamond, this one has a replacement sans diamond, the pearloid trapezoid inlays in 8 fret positions in 1946 and the beveled edge white-black-white bordered (on 3 sides only) elevated pickguard in 1949. That was the final design change; the model was discontinued in 1971. It has a gold decal “Gibson” postwar script logo on a black overlain headstock with the black bell-shaped truss rod cover; this example has replaced tuners (although the originals are in the case). The fingerboard and bridge are Brazilian rosewood, the fingerboard is bound in ivoroid and so is the top and the back. F-holes are unbound; the top is tobacco sunburst, the back and sides are uniform brown. There are a group of dings on the upper bout treble side and also on the lower bout bass side and next to the tailpiece. There is a repaired center seam crack along with signs of finish checking on both the top and back of the body. The back is mostly clean – there is light scuffing and an area of which the finish seems to have reacted to (maybe) making contact with a strap for a long period of time. The sides also show light dings, scuffs and scratches. The trapeze tailpiece is a replacement, the case is a newer Guardian brand arched top hard shell and the nut was replaced by us in 2013.